When most indie developers finally manages to get their game through Greenlight, every wake minute is spent preparing its Steam launch. Not quite so with Zut Games, the team behind Boulderdash inspired puzzler, Pushcat, as they somehow found the time to also craft a proper fun demake of their game. 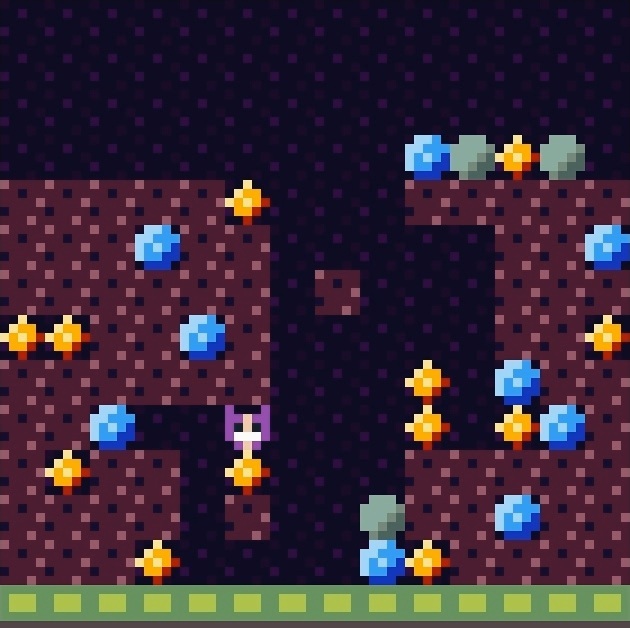 Push blocks to clear paths, drop diamonds and gems onto other diamonds and gems, making matches of three, to then grab the shiny outcome – that’s pretty much Pushcat Jr. in a nutshell, not unlike the original. But don’t let its rather simplistic looking design fool ya, as this game – like the original – is anything but easy, and getting stuck is not entirely uncommon. Fortunately, you’re able to retrace steps one at a time however, fixing any and all mistakes made, which should help you eventually succeed. Maybe. Now, demake being demake, certain features have obviously been left on the cutting room floor, including the procedural generation of content. Not that there’s anything wrong with pre-made levels though, even if it does result in less replayability. But on the flip side… we are talking about a free game here, and as I mentioned earlier, there’s plenty fun to be had in this official demake. But wait, we mustn’t forget about the reason for Pushcat Jr.‘s existence: following a successful Greenlight campaign, Pushcat is… about to hit Steam! That’s right, after almost to two years in the system, the purple cat is finally getting ready for its debut on what some believe to be the grandest digital gaming stage of them all. Groovy? You bet ya. Update: Pushcat is now available for Windows, OS X from Steam, carrying a $4.99 price tag.